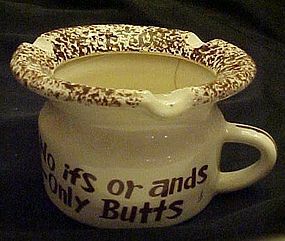 Cute hand decorated ceramic ashtray is in the shape of a chamber pot. brown sponged edge with 3 rests for cigars or cigarettes, Measures 3 5/8" tall and has a diameter of 5 1/2".No chips but there is a crack (see in photo). THe front says "No Ifs or ands ~ Only Butts".